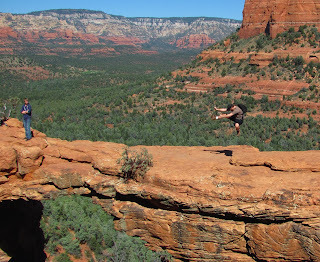 The Devil's Bridge is a 50+ foot natural arch located in Sedona Arizona. You can actually stand on top of it by climbing a rock staircase built into the side on the mountain. The Devil's Bridge Trail is one of the most popular hikes in Sedona and a lot of the information about this hike on the internet is wrong. The official Forest Service website incorrectly lists the hike as only 1.5 miles round-trip. In actuality, the hike is 5 miles round-trip. I thought I would do post about it to clear up some of the confusion about this hike. The parking area listed on the Forest Service website, and many other websites, is only accessible if you have a 4 wheel vehicle with a high ground clearance. There are several tour groups in town that will shuttle you by Jeep to the closer trail-head for a fee, but most people will have to use the ‘overflow’ parking area for the Devil’s Bridge further down the road. The hike from this trail-head is at least 5 miles round-trip. Having just finished this hike last week, it’s obvious that a lot of people are getting bad information about this hike online. We saw several groups of people hiking with little or no water. 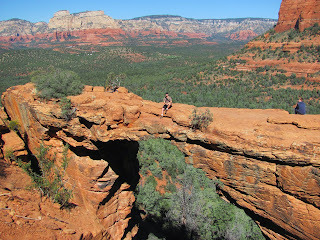 The Devil’s Bridge Trail also has several forks and many people seemed lost or confused because they expected the arch to be closer. The trail runs snakes downhill from the parking lot through a forest of green high-desert shrubs and small trees. Its crosses through several dry creek beds and forks several times at marked crossings. The last half mile of the trail heads uphill towards the the arch until you reach a set of rock stairs carved into the mountain. At the top of the stairs, you can cross over from the mountain onto the top of the arch. Directions: From Sedona, Take 89a and make a right onto Dry Creek Road. In 2 miles, turn right onto Vultee Arch Road. Vultee Arch Road is unpaved. Follow Vultee Arch Road for approximately 1 mile until you see signs for the Devil’s Bridge Trail-head parking Area. The Devil’s Bridge trail-head is marked and starts in the overflow parking lot. The trail forks several times at signed intersections and is approximately 5 miles round-trip.